Race vehicles, hobby cars, motorcycles, boats, campers, lawnmowers—when it’s time to get your seasonal vehicle started, the last thing you want to deal with is a dead battery. CTEK fully automatic battery chargers maintain the charge on your battery, keeping it ready for action, and prolonging its service life! 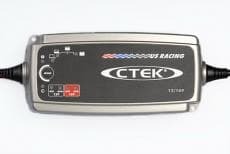 CTEK chargers contain patented technology that maintains your vehicle’s programming, protects against sparking and polarity reversal, and works in any type of weather. Don’t let a dead battery keep you in the garage—protect your investment with CTEK!